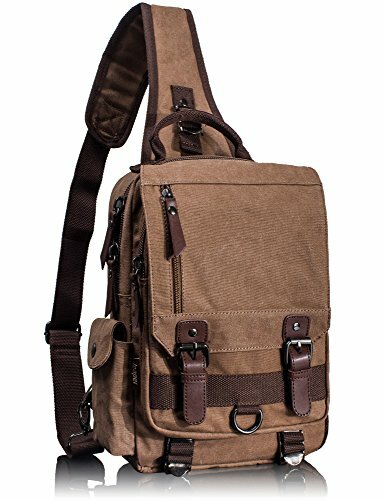 Leaper Canvas Messenger Bag Sling Bag Cross Body Bag Shoulder Bag Coffee, L | What Should I Say? For more than 15 years, Leaper is specialized in creating various backpacks to satisfy every customer's need. Our products include laptop bags, casual backpacks, daypacks, travel bags, outdoor bags, school backpacks, rucksacks, handbags, messenger bags, toiletry bags, etc..
Our bags are upgraded fast to keep up with global fashion. We develop our bags according to the feedback data from our customers. Now, our products are exported to more than 20 countries, such as Europe, US, Mid East and Australia, etc.. The canvas bag is vintage and retro. You can return the item within 30 days after delivery. For quality issue, we can refund or send a replacement; For shipping issue, contact us firstly, so that we can check the shipping and resolve the issue for you; For other issues, contact us, and we would assist you resolving the issue. TIPS: For any issue, please contact us firstly so that we can resolve your issue before you post a feedback or review. Since the size is measured by hand, the real item could be slightly different from the size above. Due to lighting effects, monitor's brightness/contrast settings, etc., there could be some differences in the color tone of the pictures and the real item. MFG Limitations: do get wet, avoid heat, avoid squeezing, etc. Material: Soft and durable Washed Canvas with PU Leather Decoration. The messenger sling bag is made of a very durable looking canvas material on the outside and a softer, more luxurious material inside the main compartment. NOTE: We have updated the tag, two tags are randomly sent. We appreciate your understanding. Size: 10.2*13.6*4.4 in (L*H*W). The shoulder bag can fit a slim laptop up to 13" without laptop sleeve/case. This canvas backpack is not a large backpack, but it is a great size to take to a day trip or shopping. The bag can be either carried with the hand handle or adjustable shoulder strap. Weight: approx. 810g. The full length of the strap: approx. 41in. The canvas backpack is vintage and multifunctional with lots of pockets. 1 zipper pocket is in the front flap; 1 zipper pocket and 1 open pocket are under the flap; 2 side pockets. The main compartment is fitted with two zip heads and pulls: 1 inner zipper pocket; 1 inner laptop pocket; 2 inner small pockets. A small laptop, iPhone, wallet, snacks, tickets and magazine will all fit comfortably with room left over for add-ons. The buckles on the top flap open and close easily and keep everything very secure. The zipper pocket on the top flap can put tickets and passport for easy access. The strap is adjustable and ultra-comfortable across your back and chest. It can act as a single-shoulder bag/sling bag, or a cross-body bag for use. Stylish, Unisex and Effective: It is a nice little bag for school, college, working, dating, shopping and traveling in daily life. Although it is not waterproof, it can also be carried for outdoor activities, such as running, cycling, camping, etc. It is a great gift for your friends and family. If you have any questions about this product by Leaper, contact us by completing and submitting the form below. If you are looking for a specif part number, please include it with your message.